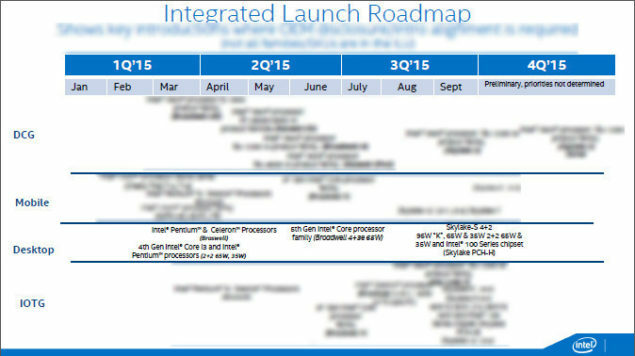 Intel Skylake is yet again the highlight of the day as a roadmap that details the launch schedule of the 6th gen processors has been leaked ahead of launch. The roadmap which was leaked by Chinese websites gives a clear insight on the desktop series which is going to be announced at IDF ’15 and will be launched in the consumer market just a month later, in September. Along with the desktop series, Intel is going to bring a massive update to its entire mobility lineup which is detailed in the article. The Skylake lineup includes several SKUs, powering the desktop side would be the Skylake-S series, the Skylake-Y series would power the Core M based processors aimed at ultra low TDP devices, the Skylake-U processors will be offered in the more mainstream mobility devices while the Skylake-H series will consist of the high-end, performance focused mobility chips that will include both regular HQ variants along with Xeon processors for consumers demanding extra workstation capabilities on developer notebooks. The lineup definitely includes a lot of processors and Intel will make Skylake their most fastest and biggest shift from their previous generation of processor lineup codenamed Broadwell. Broadwell is going to launch on 2nd June 2015, during Computex however listings of the processors along with a few Skylake-S series chips can be already found on several online retailers. The schedule was revealed by one of our key sources and also reported by site, Benchlife, which goes into several details or the related Skylake series SKUs. Intel Skylake-S series is the name for the desktop specific processors which will be compatible with the LGA 1151 socket and 100-series motherboards. These processors have previously been confirmed to be arriving in Q3 2015 however, they will make two appearances during the third quarter. In August, Intel plans to announce them at their IDF ’15 even in San Francisco while the chips and motherboards will be available in retail markets during September 2015. We have seen some listings appear online for a few Skylake processors however they are part of the tray samples which are currently circulating the market and not actual retail chips. The Skylake-S lineup will consist of several 95/65/35W chips featuring Quad and Dual core designs along with Gen9 GT2 graphics. The first two processors that include the Core i7-6700K and Core i5-6600K were leaked a few days ago and are labeled as “Enthusiast” 95W processors. Starting off with the flagship Core i7-6700K CPU, we are looking at a quad core design with eight threads which shows a multi-threaded design. The chip features 8 MB of L3 cache and has clock speeds maintained at 4.0 GHz base and 4.2 GHz boost clock. The chip can support DDR4 2133 MHz memory and DDR3L 1600 MHz memory. Similarly, the Core i5-6600K is the more cost conservative enthusiast offering and being a quad core, it stays away from a multi-threaded path. The clock speeds are maintained at 3.5 GHz base and 3.9 GHz boost and has a total of 6 MB of L3 cache with similar DDR4/DDR3L memory support as the top offering. These Skylake processors will have several features that include increase IA and graphics performance at much lower power than their predecessors. While the TDP remains 95W, Intel has further improved the efficiency of these new chips hence delivering much better performance. The Skylake processors will support both DDR3L and DDR4 memory types. The DDR3L memory will be available on the mini-PC designs such as All-in-ones and NUCs while traditional PCs which will get Z170 and H170 series motherboards will have native support for DDR4 DIMMs. The unlocked processors options which are also the Enthusiast CPUs as detailed above will allow enhanced full range BCLK overclocking. Hopefully, Intel will use better TIM or Soldering to prevent any heating issues on the dense 14nm chips. Other features includes Turbo Boost 2.0, Hyper Threading, DMI 3.0, 3 digital displays capability (including embedded Display Ports), HEVC, VP8, VVP9, AMCs and support for the latest APIs such as DirectX 12, OpenGL 4.3/4.4 and OpenCL 2.0. We have already seen Z170 motherboards from Colorful with the LGA 1151 socket in full details. Coming to the mainstream lineup, we are looking at 4 chips which include the Core i7-6700 that features same specifications as the Core i7-6700K but doesn’t come in an unlocked package. Similarly, the Core i5-6600 also has the same specifications as seen on the unlocked model but without the K-Series design that allows over-clocking support. Clocks for the Core i7-6700 are maintained at 3.4 GHz base and 4.0 GHz boost while the Core i5-6600 is clocked at 3.3 GHz base and 3.9 GHz boost. The Core i5-6500 is a quad core clocked at 3.2 GHz base and 3.6 GHz boost while the Core i5-6400 is a quad core clocked at 2.7 GHz base and 3.3 GHz boost. All of these chips feature a 65W TDP and the Core i5 models pack 6 MB of L3 cache while the Core i7 model gets 8 MB L3 cache. Over at the more power efficient side, Intel will launch 4 T-Series chips which stand for low-power. All chips feature just 35W TDP and include Core i7-6700T as a multi-threaded quad core with 2.8 GHz base and 3.6 GHz boost clock. It packs 8 MB of L3 cache. The Core i5 models range from the Core i5-6600T, Core i5-6500T and Core i5-6400T featuring 6 MB of L3 cache, quad core (non-multithreaded designs) and boost speeds ranging from 2.8 to 3.6 GHz. The Skylake-H series processors are aimed at more performance focused mobility devices with several quad and dual core designs. In this series, we will be looking at some very high-end and faster clocked HQ/HK/H variants along with Xeon mobility chips that will power workstation suited notebooks. The processors in the lineup include the Core i7-6920HQ, Core i7-6820HQ, Core i7-6280HK, Core i7-6700HQ, Core i5-6300HQ, Core i5-6440HQ and the Core i3-6100H. The Xeon mobility side includes the Xeon E3-1535M v5 and Xeon E3-1505M V5. This is after a long time that Intel will launch proper Xeon E5 chips for the mobility platforms. Launch of these chips are expected in September for the first series of chips than November will see the launch of the faster Core i7 chips along with the Xeon parts. The Intel Skylake-U series will replace the Broadwell-U series processors which currently has the Core i7-5500U as the flagship part. The lineup will get three processors, Core i7-6500U, Core i5-6200U and Core i3-6100U in September 2015 and Core i7-6600U, Core i5-6300U in January 2016. All of the processors are dual core models and specifications are not know at the moment in regards to clocks speeds, TDPs and graphics unit but the Core i7-6600U will be the flagship part of this lineup which are aimed at the main stream notebook devices. Lastly, we will also have an update to the Core M or Y-Series processors. This lineup will see the launch of several chips in the timeframe from Q3 2015 to Q1 2016. Intel will first launch the Core M-6Y75, Core M-6Y54 and Core M-6Y30 in September 2015. The next lineup will have Core M-6Y85 and Core M-6Y57 as the new updated parts for January 2016. These processors will be dual core designs with multi-threading enabled. While Broadwell Core M series showed these chips in the 4.5W segment, Skylake will further tone it down while bringing far better performance per watt due to IPC increases. These motherboards will launch with the Skylake-S platform in September. Motherboards from other manufacturers such as ASRock and EVGA have also been confirmed a few weeks ago that include the Z170 Extreme4/C, Z170 Extreme6, Z170 Extreme7, Z170 Extreme7/ac.